Hover your mouse over a line of the poem and the original surrounding text will appear. If you’re using a touchscreen device, touch any line. Click here to read Collier Nogues on the origin of the poem. This poem is from The Ground I Stand On Is Not My Ground, forthcoming from Drunken Boat in April 2015. All of the book’s poems are erasures of historical documents related to the Pacific War. 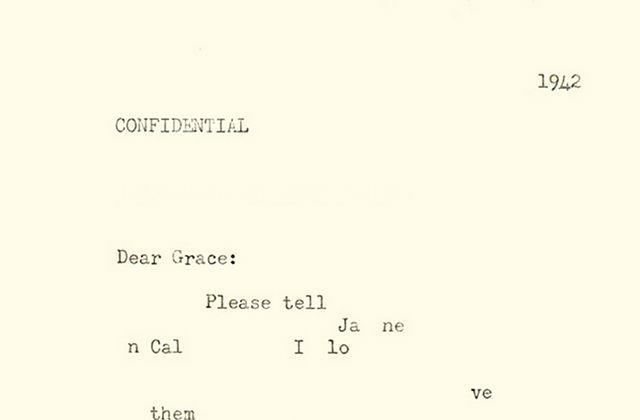 This poem’s original text is a 1942 memo from Assistant Attorney General James Rowe, Jr. to President Roosevelt’s secretary, Grace Tully, suggesting that Roosevelt take action on “the Japanese situation in California.” Two weeks later, Roosevelt signed Executive order 9066, which made possible the forced evacuation and internment of more than 100,000 American citizens of Japanese descent. Rowe’s memo is so spare, but its subject is such a vast and lasting event—most visibly in the lives of the internees and their neighbors and descendants, but also traceable in U.S. military and domestic policy throughout the 20th century. And plenty of people have pointed out that the rhetoric which made internment possible in 1942 echoes too familiarly today in fearmongering about Americans who look like “the enemy” in our 21st century wars on terror and drugs. Reworking Rowe’s words over and over, mining them for all the alternative sense I could, became a way to approach the text’s simultaneous spareness and incredible density. It didn’t take long before I ran out of complete sense-making sentences, and began to work with fragments and patterns of sounds. The result is a series of epistolary poems which, I hope, chart the failure of language to express what war feels like while it’s happening to an individual person, far from the chambers of power in which “situations” are smoothly summed up on a single sheet of paper. “Dear Grace” is the only poem in the manuscript which erases the same page obsessively, and I think you can feel that obsessiveness in the poem. It’s one of my favorites. Collier Nogues is the author of The Ground I Stand On Is Not My Ground (Drunken Boat, 2015) and On the Other Side, Blue (Four Way, 2011). She teaches creative writing at the Chinese University of Hong Kong, and co-edits poetry for Juked.